The Arcteryx Women's Covert Cardigan is the perfect middleweight insulator for cold weather camping or climbing, and providescozy warmth with sleek style. This award winning Polartec Thermal Pro fleece jacketwas designed with highly breathable, quick-drying sweater knit material. 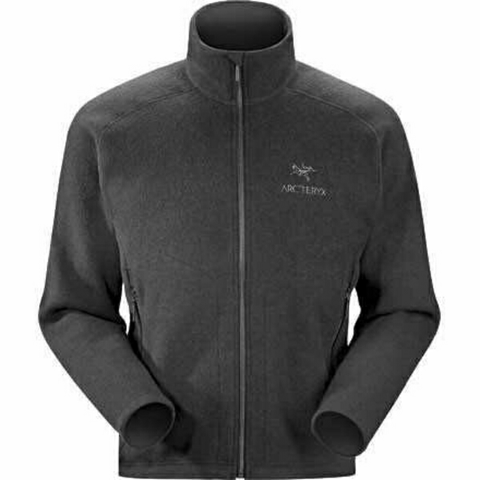 The full front zip Arcteryx cardigan offers the sophisticated appearance of cashmere, while the active athlete will appreciate the durability of the non-piling fleece, gussetedunderarms for added strength, and the light weight of 13 oz. for mobility. Two hand pockets with laminated zips keep your goods dry… as they should be. With the additional laminated sleeve pocket, thehighly functional Covert Cardigan is perfectfor stylish casual wear, or more strenuous activity like Wii Bowling, or worse, Dance Dance Revolution. FEATURES of the Arcteryx Women's Covert Cardigan*. Breathable, quick-drying fabric boosts thermal performance*. Two laminated hand pockets and one sleeve pocket with glued-in zippers*.